David Giffin is a former Australia vice-captain who made 49 appearances for the Wallabies. At the height of his powers he formed a strong partnership with Wallabies skipper John Eales, which helped Australia to their second Rugby World Cup in 1999. Giffin made his debut for the Wallabies against Wales in December 1996 and quickly established himself as first-choice in the engine room. 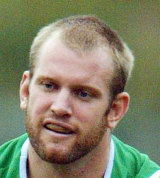 Giffin went on to take his place in Australia's 2003 Rugby World Cup squad, but he was mainly used from the bench as Nathan Sharpe and Justin Harrison took the second-row slots. His final appearance came in the victory over New Zealand in the semi-final of the 2003 Rugby World Cup. At club level he played three times for his home state of Queensland before joining the ACT Brumbies for the inaugural Super 12 competition. He went on to make 81 appearances for the Brumbies, including scoring the winning try in the final of the 2001 competition.